Process: After the uniform or belt embroidery order is placed, an embroidery design layout will be sent for review and approval prior to embroidery. Belt production will begin when the order is placed, but embroidery will not begin until the layout is approved. Allow up to 12 business days from the order date for the layout, and up to 4 weeks from the order date for production to be completed. 12 business day and 6 business day production options are also available for embroidered items. Languages: For Japanese, names and non-Japanese words will be translated using Japanese katakana characters. Katakana is interpreted phonetically. Most martial arts styles and other words will be translated using kanji characters which are interpreted literally. There are three different fonts available for the Japanese and Chinese - "kai", which has very structured strokes; "gyo", which has free-flowing strokes; and "goth", which has block structure. Korean is also available in two different fonts - "gungsu", which has a scripted appearance; and "dotum", which is very linear. Please clarify any difficult pronunciation of names in the Special Instructions area. Other languages such as Greek, Hebrew, Russian and Arabic can be embroidered but translations for these languages will need to be provided by email. Thread: We are currently using genuine American Iris trilobal polyester embroidery thread, which is the only thread of it's kind made entirely in the USA. A wide variety of colors are available including metallic threads. See below for thread color details and restrictions. Thru-Belt: This is our standard embroidery method which involves using a similar color bobbin thread for single color embroidery. This gives the back surface of the belt a consistent color and the text has a mirror image effect. The embroidery on the front of the belt is sharp and unobstructed, as it is applied on top of the construction stitches of the belt. Logos and multi-color embroidery have a less-than-finished look on the back. There is no guarantee for the look of the back surface of the embroidery, since the back surface is where the top thread and the bobbin thread meet and tie off. Front-Only: This embroidery method involves a special belt construction in which the embroidery does not show on the back surface. The construction threads of the belt will ride over the top of the embroidery on the front, giving it a unique look. This technique prevents the embroidery site from becoming puffy and weak in structure. We will not embroider rank stripes using this method. Front-Only embroidery is only available for select belts, where offered. Front-Back: This embroidery method involves a special belt construction that allows for embroidery to be placed on the front and back surfaces of the belt. The back surface embroidery can be the same as the front or it can be something completely different if you like. The back surface embroidery is included in the Front-Back cost as long as it is of equal or lesser value. The construction threads of the belt will ride over the top of the embroidery on both surfaces, creating a unique look. This technique prevents the embroidery site from becoming puffy and weak in structure. Use the Special Instructions box to add the back surface embroidery details. Rank stripes, however, will always be sewn as Thru-Belt and not Front-Back or Front-Only. Front-Back embroidery is only available for select belts, where offered. Logos: Logos with multiple thread colors will be embroidered with a white bobbin rather than matching each front surface embroidery color. The back surface, in this case, will be a bit random in coloration but will primarily be white. If a logo has only one color, or in some cases two colors, we will match the bobbin thread to the front surface embroidery colors. Embroidery Thread Colors: A wide variety of thread colors are available, including a variety of gold colors, metallic thread, and two-color embroidery effects such as Shadow and Outline. However, metallic thread is not available for Shadow or Outline embroidery, nor for stiff-core belts. 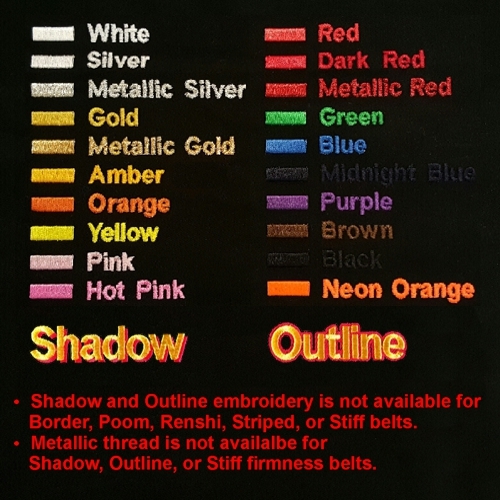 Also, Shadow and Outline embroidery is not available for Poom, Renshi, or Stripe belts. Fonts: Some fonts are better suited for embroidery than others depending on the location and size of the embroidery location. Fonts with serifs and thinner elements, such as Old English or Algerian, embroider more cleanly when the font size is large. Fonts without serifs or with consistent column thickness, such as Arial and Rockwell, are more suited for smaller font size embroidery. Also, consider ALL Caps or simple fonts for vertical orientation embroidery. We don't recommend Script font for vertical embroidery.